Organized after Fort Sumter, the Third Louisiana Volunteer Infantry Regiment fought bravely in the Battles of Oak Hills (Wilson’s Creek), Elk Horn Tavern (Pea Ridge), Corinth and Iuka. The Third Louisiana fought U. S. Grant’s Army of the Tennessee in the defense of the city of Vicksburg, Mississippi, enduring the 48-day siege before being part of the force surrendered by Pemberton on July 4, 1863. Will Tunnard grew up in Louisiana after his parents moved to Baton Rouge, Louisiana in 1839. 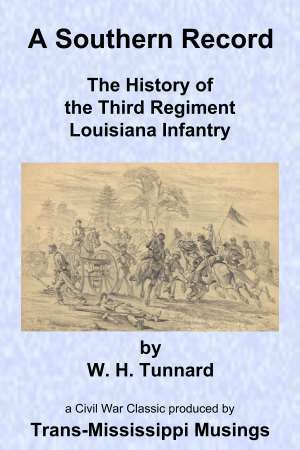 In December 1860, Will Tunnard volunteered to join the Pelican Rifles Company, which was soon mustered into the Third Louisiana Volunteer Infantry Regiment. Will Tunnard made good use of his experience as a newspaper man. Throughout the war, Will kept a diary, which he used to write this regimental history, originally published in 1866.